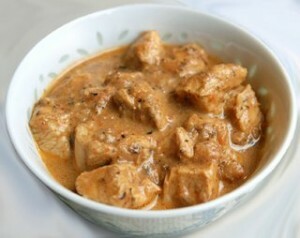 Korma recipe by UrS2LuV at DesiRecipes.com. Add cooking oil to a large pot add onions and fry till golden brown then remove and place on paper towels and crush! Next add the meat/poultry to the same oil and fry for a few seconds then add ginger /garlic and fry about 1-2 minutes the meat/poultry will change color slightly. Now add the tomato paste and keep frying add all the spices and reduce heat add yogurt few tablespoons at a time this will make the sauce thicker! You spicy korma is ready to eat!! May be served with plain white rice or naan!! Very nice recipe! I tried making it,it turned out great!